When an insurance claim is filed, it means there has likely been an accident or some damage to a person’s car, home, or business. Understandably, most people aren’t thrilled to have to go through the claims process. However, customer experience is still vitally important in the insurance industry and can make the journey more pleasant for everyone involved. 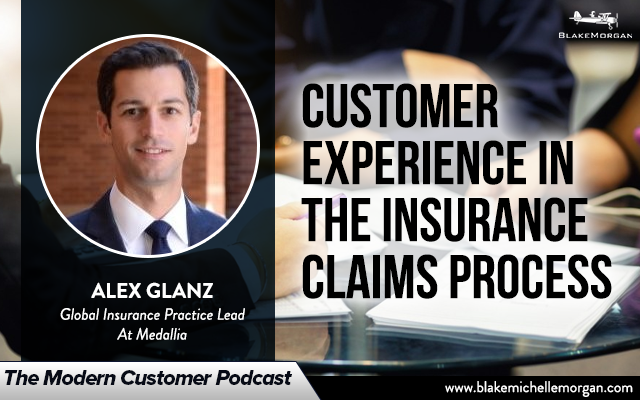 According to Alex Glanz, global insurance practice lead at Medallia, the insurance industry is similar to other subscription businesses—customers pay in advance and feel the value of their purchase later. Customers use insurance all the time. Although they likely aren’t frequently filing claims, having the peace of mind that they are protected no matter what happens will improve the quality of life of a customer. In the insurance world, there is a natural tension between saving money and helping customers. Insurers want to provide a great customer experience and follow through on their promises, but they also want to manage claims efficiently and effectively, which can often be at odds with each other. Sometimes to create a good customer experience the claim needs to take longer to process, but that costs more money, just like making detailed estimates can hurt customer experience. In general, the better the experience, the higher the cost. The balancing act for insurance companies is to create fair outcomes while managing costs to best serve customers. In order to do that, insurers should think about things from the customer’s perspective. This week’s guest on the Modern Customer Podcast – Alex Glanz – recommends using data to understand the customer journey and see the points where the company’s actions aren’t meeting the customer’s expectations and using those as areas for improvement. Truly providing a great customer experience comes from having a customer-focused culture. According to Alex, everyone in the company must be focused on customer experience. It needs to start with the C-Suite and spread through the entire company. The best companies democratize their data and get it into the hands of people who can take action. When everyone engages around customer experience, customers are satisfied and loyal to the company. Alex preaches the importance of operational customer experience, which is different from a research based approach, and focuses on an agile, emotional response. Many companies fall into the trap of doing research about customer experience, coming up with a strategy, and slowly rolling it out in controlled segments. However, the best customer experience responds to the needs of customers and is more flexible. Real customer experience grows as it is part of a company’s day-to-day operations and a living piece of what every employee does. The goal of customer experience for a brand should be to remove friction, and that goal is critical in the insurance industry. As customers file claims during difficult times, companies should be looking for ways to make the process smoother and help make customers’ lives easier, not more difficult. Improving customer experience helps lower costs, which keeps things in balance. Although the insurance customer journey might be unlike that of any other industry, customer experience is still a vital part of the insurance process and can be developed by knowing and understanding customers.